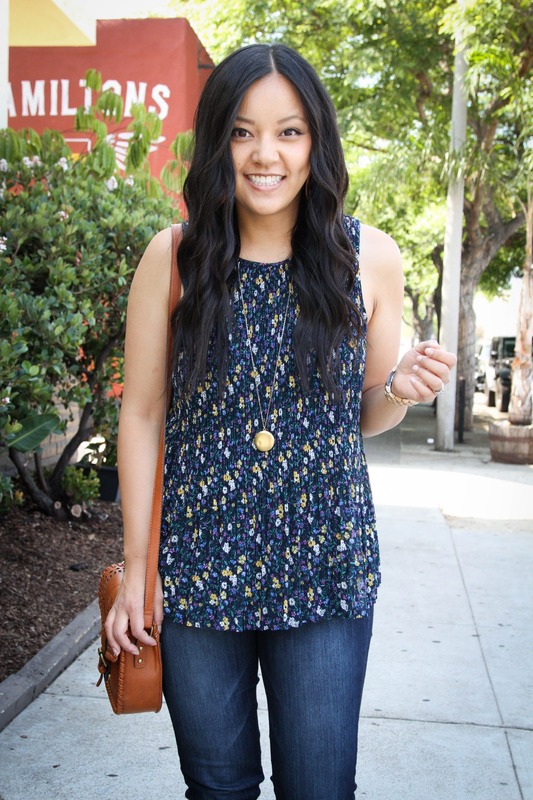 One closet staple I don’t talk much about is a navy based printed top. Strange that I scarcely mention it, since I’m drawn to them *almost* as much as I’m drawn to striped tops! 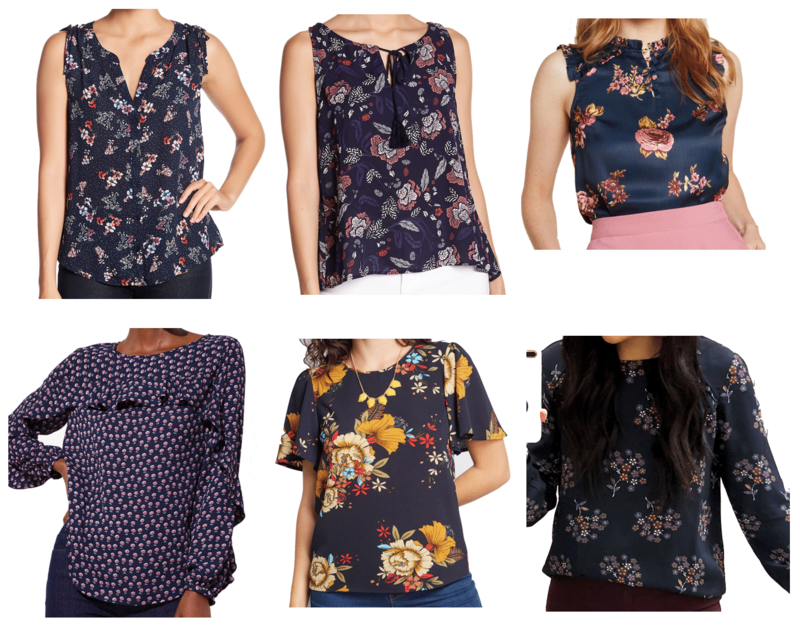 I’ve got navy based printed tops in the form of blouses, casual tops, long sleeves, short sleeves—you name it! 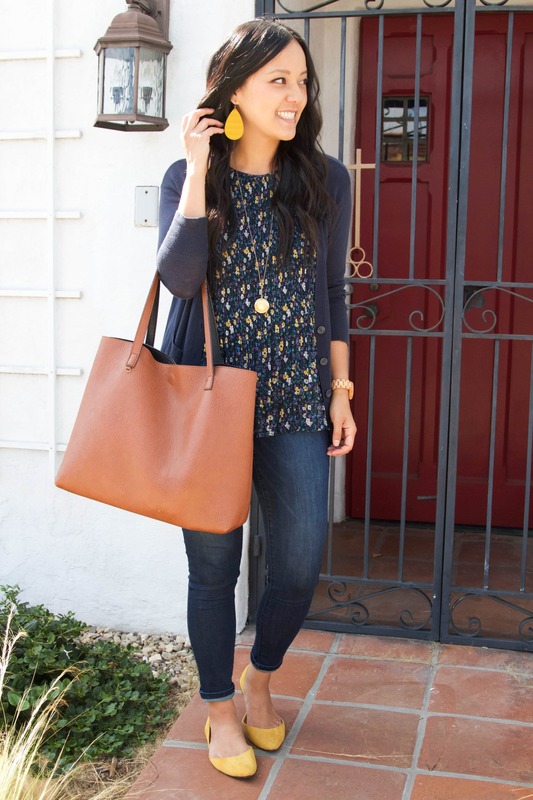 The navy background makes them pretty versatile since navy is a neutral and goes with almost everything. The print provides visual interest while any colors make it easy to accessorize and coordinate with. 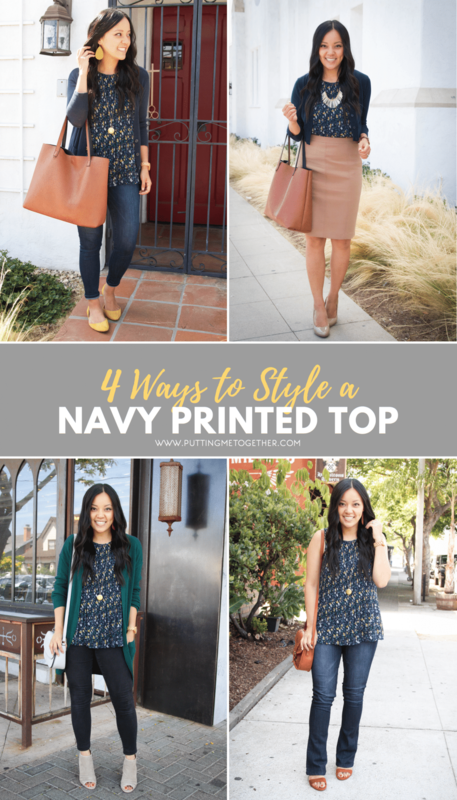 Today I’m sharing 4 outfits with a navy printed top to give you ideas for how to wear one! I shared this top during the NSale in July, and while it’s sold out now, don’t worry if you didn’t get one. 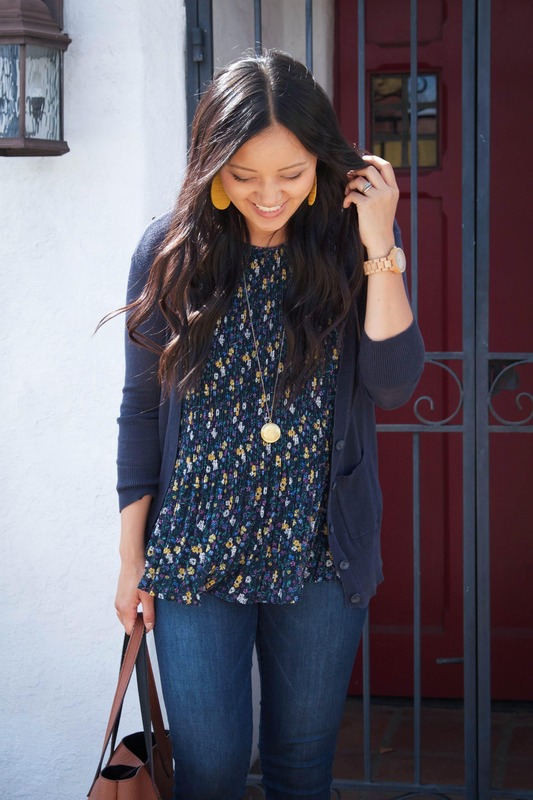 You can still do these looks with almost any navy printed top of any sleeve length! We have a few options at the bottom of this post too! Here are some ways to wear one! Side note: I always feel the tension of remixing or heavily featuring things that aren’t in stock anymore. I want to show everyone who got the item more ways to wear it, but I also know it’s super disappointing for people who didn’t get it but want it now and can’t get it anymore. Anyway, just random blogger thoughts! 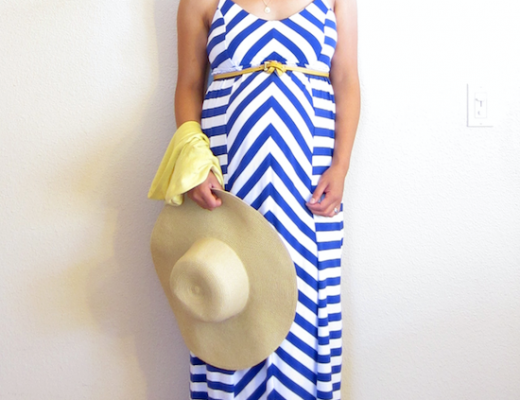 With navy, I typically love yellow or red as pops of color that really stand out from the blue. Orange and green are fun too! But really, any color from the print of your top usually works well. Here’s another example of jeans with a pop of color, but thanks to a different shape of denim, the outfit feels really different than the previous one. 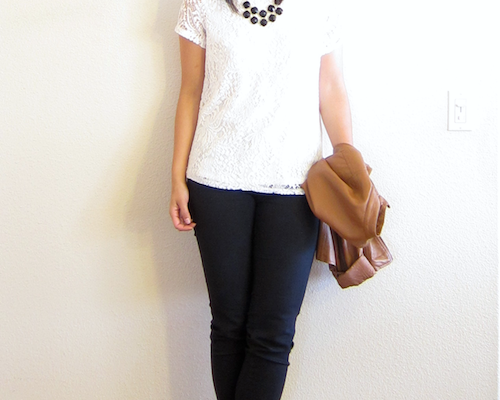 Easy way to get more out of your closet is to have different types of bottoms, whether in color or shape! These jeans are the Wit & Wisdom bootcut jeans that I’ve talked about for years saying they feel like yoga pants. I still stand by that, and I know a bunch of PMTers say the same! They are soooo soft through the leg, plus they have elastic in the back of the waistband, so they are crazy comfy! My exact pair is sold out, but there’s an updated version HERE. Not sure if they’re as soft, but hopefully they are! (Nordstrom has free shipping and free return shipping, so it’s no risk to try!) 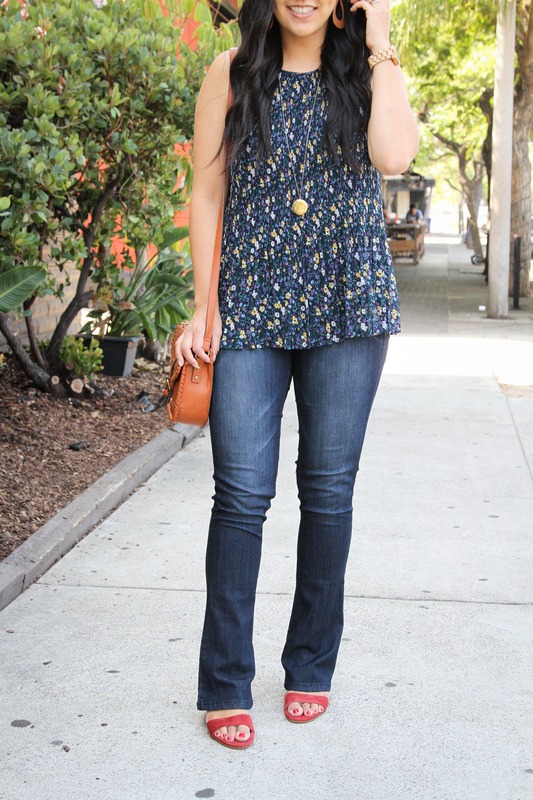 And if those were too short for you, check out my past post with 12 Outfits With Bootcut Jeans. It includes lots more options, some of which are better for taller people! Sizing for the W&W bootcut jeans is interesting. I wear size 8, but technically can fit size 6. However, size 6 looked weird on me because they were too tight around my thighs and did two things: 1) made the bottom flare out more like a bell bottom, and 2) made the whole thing shorter since the material was busy trying to cover my thighs, haha! Size 8 was way, way, way more flattering and elongating! 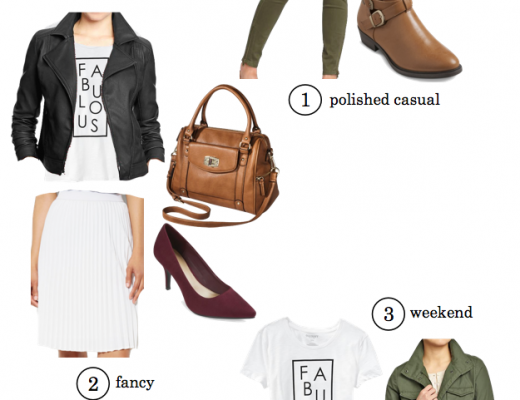 Tuck it into a skirt for a business casual look! Any neutral color works. For example, you could do a navy skirt and the same yellow accessories as the first outfit. But just to change it up, I went for a tan pencil skirt. I’ve said before that while I don’t usually wear cropped cardigans, I often prefer them over regular fitted cardigans when paired with skirts and dresses. 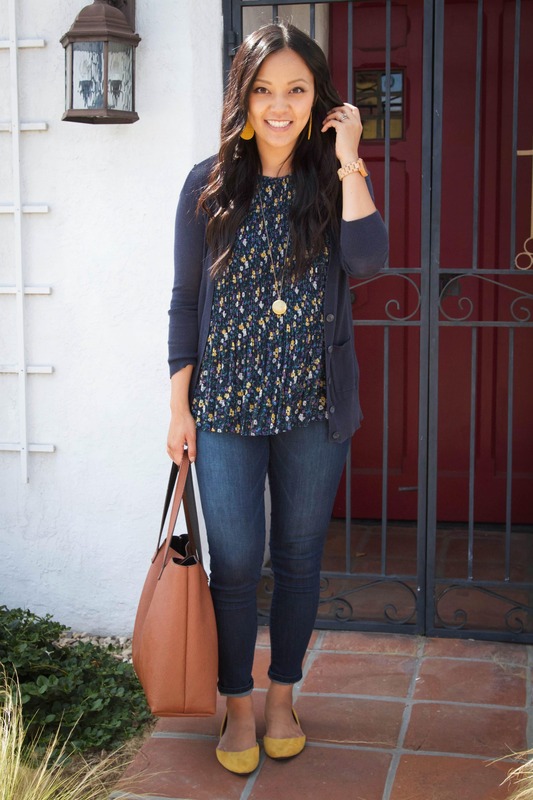 Lastly, moving away from the navy, pair your navy printed top with black bottoms (jeans, skirt, or pants) and add a cardigan in a color from the print! 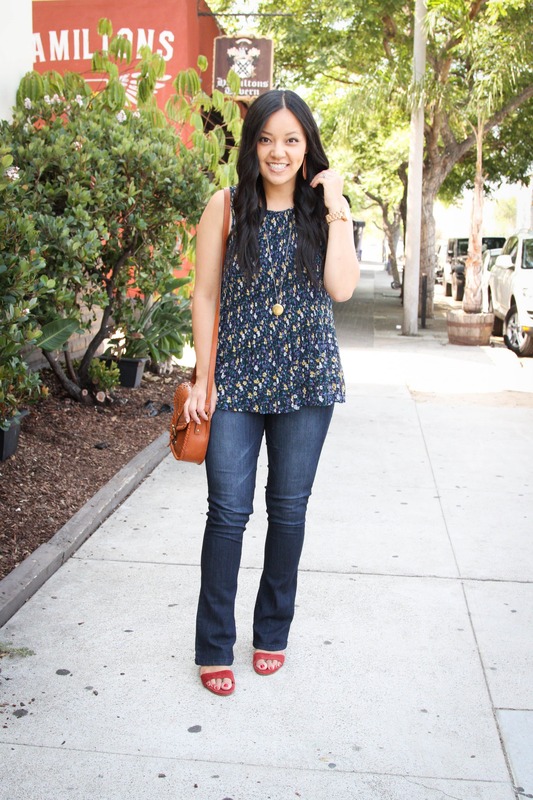 Here are more that are really easy to do with a navy printed top! Gift Giving Made Easy + Gift Ideas for Birthdays, Babies, Kids, Bridal Showers, and More! Pretty top and I particularly love it styled w/ the skirt and also the pops of yellow! It’s OK that it’s out of stock. You don’t have to feel bad. Your style examples can be carried over to pieces that I own. This top is available in Nordstrom Rack for a steal! Based on your recommendation, I added the black Wit & Wisdom skinny ankle jeans to my Christmas list last year and was excited to receive them. At first, I was really happy with them, but they have faded horribly since then; so much so that I can no longer wear them to work, which was one of the main reasons I wanted them. Have you had this problem?